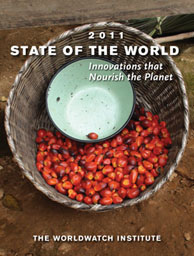 The Worldwatch Institute has published today a report entitled the State of The World 2011: Innovations that nourish the planet, which highlights agricultural innovations effective and hits the important to prevent food waste, to create a capacity for adaptation to climate change, and strengthening farming in cities. The report shows a work plan for increased agricultural investment and more efficient ways of alleviating hunger and poverty in the world. Based on the knowledge of agricultural experts more important in the world as well as hundreds of innovations that are already underway, the report outlines 15 recipes that have been shown to be viable from the environmental point of view. “The progress presented in this report serve to document the governments, the politicians, the NGOS and donors that seek to curb hunger and poverty, and provide a clear working plan to extend or repeat the triumph in other places,” said Christopher Flavin, president of Worldwatch Institute. “We need those more influential on agricultural development to commit to help in a lasting way, the farmers, who constitute 80% of the population of Africa”. The State of the World 2011comes at a time when many initiatives to alleviate world hunger and strengthen food security –such as the program Feed the Future, the Obama administration, or the World Programme for Agriculture and Food Security (GAFSP), the World Food Programme (WFP) and the Programme of Comprehensive Development of Agriculture in Africa (CAADP)– need guidance in their commitment to expand agricultural investment. Nearly a half-century after the Green Revolution, a large part of humanity remains chronically hungry. Meanwhile, investments in agricultural developments carried out by governments, international lenders, and foundations are at historic lows. Since 1980, the share of funds of development aid in the world that corresponds to agriculture has decreased from over 16% to just 4% today. According to statistics from the United Nations, the World Bank, the International Monetary Fund and the Organization for Economic Cooperation and Development, in the year 2010, governments, foundations, and individuals spent less than 4000 million us dollars (about 3000 euros in millions) for the support of agricultural projects in Africa. Although it is expected that commitments for agricultural development will increase in 2011, still needs to raise most of the money and get to the poor farmers of Africa. According to Danielle Nierenberg, co-director of the project of the Worldwatch Nourishing the Planet (Nourishing the Planet), “the international community, in its efforts to reduce hunger and poverty, has neglected to entire segments of the food system. The solution does not consist essentially in producing more food, but in changing what children eat at school, the way in which it is processed, and marketed the food and type of food businesses in which we invest”. For example, it has been proven that serve products from local crops to school-age children is an effective strategy to reduce hunger and poverty in the nations of africa; a strategy very similar to that carried out with successful programs such as “from the producer to the cafeteria” in EE. UU. and Europe. In addition, “about 40% of the food produced today in the world is wasted before it can be consumed, which means big opportunities for producers and households to save both money and resources if they are to reduce such pérdidass”, according to Brian Halweil, co-director ofNourishing the Planet. In the year 2007, about six thousand women in the Gambia created the women’s association of collectors of oysters TRY and created a plan for sustainable shared management for the fishing industry, oysters local to prevent over-harvesting and exploitation. Oysters and fish are a source of important protein, and low-cost to the population, but in the past 30 years, the current production levels have led to environmental degradation and have created changes in land use. The government is working with groups like TRY to promote less destructive and to extend the credit facilities for low-income producers and, thus, to stimulate investment in more sustainable production. In Kibera, Nairobi, the slum largest in Kenya, more than a thousand women producers are developing gardens, “vertical” bagged uprights filled with dirt to feed their families and communities. With these bags it is possible to supply potentially thousands of inhabitants, at the time they are a source of income that is sustainable and easy to maintain for the urban farmers. Since it is estimated that by the year 2050, over 60% of the population of Africa will live in urban areas these methods pódrían be crucial to build food security in the future. Currently, about 33% of africans live in cities and, each year, 14 million migrate to urban areas. Worldwide, some 800 million people are engaged in urban agriculture and they produce between 15 and 20 percent of all the food. The pastors in south Africa and Kenya are preserving indigenous varieties of livestock that are adapted to the heat and drought typical of the place , traits that will be crucial as the extreme weather on the continent worsen. Africa has the largest extent of permanent pasture and the largest number of pastors in the world with 15-25 million people dependent on livestock. The Redde Analysis of Policies for Food, Agriculture and Natural Resources (FANRPAN, for its acronym in English) is using theatre and interactive and presented by the community to attract women producers, community leaders and politicians to engage in dialogue openly about gender equality, food security, land tenure and access to resources. In sub-saharan Africa, women make up at least 75% of the farmers and provide between 60 and 80 percent of the workforce in the production of food for family consumption and sale, so it is essential that they have opportunities to express their needs in relation to the exercise of the local government and decision making. This forum entertaining and cordial makes it easier to talk openly. The program ugandan of Development of innovations in the crop school (Developing Innovations in School Cultivation DISC, is integrating vegetable gardens with native species, nutritional information and food preparation in the school curriculum to teach children to produce crop varieties local to help combat food shortages and revitalize the culinary traditions of the country. It is estimated that, currently, 33% of african children are facing hunger and malnutrition and towards 2025, 42 million children could be affected. Nutrition programs school that is not dedicated simply to feed children, but also inspire them and teach them to become producers for the future, are a great step towards the improvement of food security. The report of The Estate of the World 2011 is accompanied by other informational materials, including documents with synthesis, summaries, databases, innovative, videos, and podcasts. All of them can be found in www.NourishingthePlanet.org. Also the project’s findings are being disseminated to a large portion of those interested in agricultural matters, such as government ministries, political of agriculture, networks of communities and farmers and communities, non-governmental environment and development which, each time, they have more influence. To carry out this research, the project Nourishing the Planet of Worldwatch has achieved unprecedented access to the international institutions of research more important, among which are those included in the Consultative Group on International Agricultural Research (CGIAR). The team also interacted extensively with farmers and the unions of farmers, as well as with communities and investment banking. In the united States, Canada, and India, contact Amanda Stone by sending an email to astone@worldwatch.org. From any other country, contact Gudrun Freese in the email address gudrun.freese@earthscan.co.uko via telephone at +44 20 7841 1930. You can buy the State of The World 2011 for 19,95 $ (a 15,15€), plus shipping and handling. It can be purchased on the website of Worldwatch, http://www.worldwatch.org/sow11 by e-mail, wwpub@worldwatch.org in the toll-free number (+1) 877-539-9946 (in the u.s. and. UU.) or (+1) 301-747-2340 (from overseas), or by sending a fax to number (+1) 301-567-9553, including the ISBN number 9780393338805. The book can also be purchased at the web site Earthscan, www.earthscan.co.uk sending an e-mail to earthinfo@earthscan.co.uk, or by calling +44(0)12 5630 2699, indicating the ISBN number 9781849713528. Worldwatch is an independent research organization based in Washington, D. C. who works on environmental issues, energy and resources. The report the State of The World, the Institute Worldwatch , is published each year in more than 20 languages. For more information, visit our website at : www.worldwatch.org.